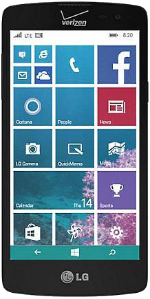 The LG Lancet is a smartphone with a 4.5-inch display with a resolution of 480x854 pixels and 218ppi density. It is powered by a 1.2GHz Quad-Core Qualcomm Snapdragon 410 processor, 1GB of RAM, and the Adreno 306 GPU. The built-in storage is 8GB, expandable by up to 128GB through a microSD card. There is an 8MP rear-facing camera included in the smartphone with a 1080p HD video camera. A secondary camera with a 0.3MP VGA sensor is available in front. The Lancet has a 2100mAh battery included that powers it for up to 18 hours of talk time and 17 days on standby mode. The device runs Windows Phone 8.1 OS.